During the Dickens Festival, the Village is transformed into a Dickensian era town with characters such as chimney sweeps, Scrooge, Father Christmas, the Town Crier, and Dickens’ Mayor roaming the streets. A wide range of mostly free events occur during the Festival including ice skating at the Village Center, musical performances by local musicians, Nutcracker performances, a cappella choirs, and harmony singers, and magic shows by the Great Wizard of the North. 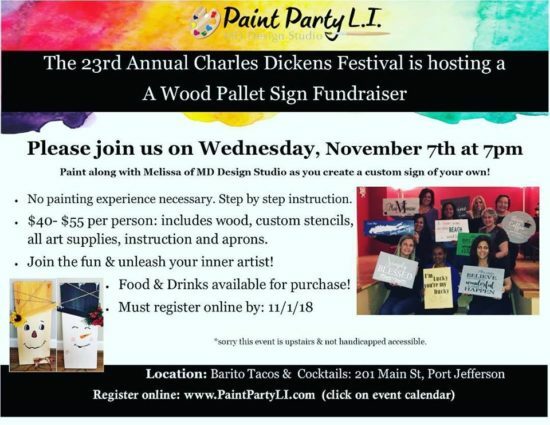 Barito supports the Festival with events such as the Paint Night. No experience with painting is needed. You will receive careful instruction on making your own sign. The cost is $40-55 per person which includes wood, custom stencils, all supplies, aprons, and of course instruction! Food and drinks will be available for purchase. Come out and let your artistic side show while you and family or friends have a great time. You must register by November 1. Barito Tacos & Cocktails, located at 201 E Main Street in downtown Port Jefferson, is proud to serve authentic Mexican cuisine with a modern twist using fresh ingredients and fresh tortillas made daily. Our Chefs Steven Scalesse and Kevin Breeden welcome you to enjoy our wide range of Mexican dishes. Feel free to make a reservation on our home page.